Create slopes, grade and contour easily and efficiently with the Hydra-Tilt™ attachment. Designed for compact excavators, the Hydra-Tilt accessory delivers maximum productivity on the jobsite when powered with a bucket. Using a hydraulic cylinder, the Hydra-Tilt attachment uses a wrist-like action to angle the excavator bucket 30 degrees to the left or right, for a total of 60 degrees of tilt range. This range of tilt allows the Hydra-Tilt accessory to dig around and under objects such as culverts and sewer lines. Save time and improve productivity on countless jobs by simply tilting the bucket left or right, instead of moving the entire machine. Power through the workday with the flexibility and productivity of the Hydra-Tilt attachment. Grading Blade and Bucket Attachments - Combine the Hydra-Tilt with the grading blade attachment or grading bucket for increased grading power. 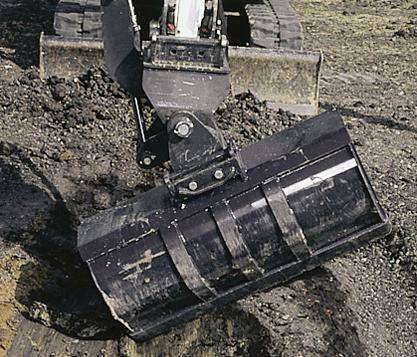 Designed for compact excavators, the grading blade and grading bucket are ideal for backfilling trenches, leveling terrain, and finish grading.